SACRAMENTO -- California's Senate majority leader yesterday proposed a carbon tax for transportation fuel to replace part of the state's landmark cap-and-trade program for greenhouse gases but immediately ran into opposition from fellow top Democrats and environmental groups. State Senate President Pro Tem Darrell Steinberg (D) pitched it as part of a broader tax reform movement that he hopes to institute, possibly in time for next year, when the state's emissions trading program expands from utilities, refineries and other industrial emitters to covering carbon-based transportation fuels, as well. "I am concerned that bringing fuels under cap and trade leaves consumers vulnerable to anti-competitive behavior and Wall Street traders, which have led to unpredictable price spikes and shortages in the past," he said at a press conference yesterday. "Under cap and trade, no one can tell us whether fuels will trade at 10 cents or 40 cents a gallon in 2015." But Democratic Gov. Jerry Brown's office threw cold water on the idea, and Mary Nichols, head of the Air Resources Board, which runs cap and trade, defended the existing program. "His argument about volatility of prices does not seem to me to be the strongest argument in favor of this proposal," Nichols said. "Gasoline prices are fairly volatile as it is; they swing a dollar or more in any given year. The worst number that anyone has come up with for fuels under the cap is 12 cents a gallon, and that's not volatile." 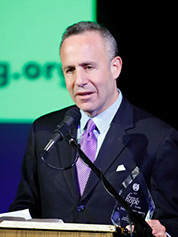 California Senate President Pro Tem Darrell Steinberg (D). A carbon tax -- long batted around in Congress and at the state level as an alternative to market-based or regulatory emissions programs -- would provide consumers with a more stable price signal, Steinberg said. The tax would start out at $15 per ton of carbon and rise to $50 per ton by 2030 with different taxes based on a fuel's carbon content. A tax of $15 per ton would translate to a 15-cent-per-gallon tax on gasoline, rising to 25 cents by 2020 and 50 cents by 2030. He proposed using roughly two-thirds of the proceeds on an earned income tax credit, which would pay out $2.5 billion to low- and medium-income residents in its first year. The tax credit would be given out on a sliding scale based on income, marital status and number of children. A family making $75,000 per year would receive $600. The rest of it -- another $1 billion in 2015 -- would go to mass transit projects. Cap and trade, in comparison, is projected to generate $850 million in revenue from carbon auctions in the 2014-15 fiscal year, a quarter of which must go to projects that benefit disadvantaged communities under a 2012 law, S.B. 535. The rest of the money is intended to be spent on other projects that reduce greenhouse gases; Brown has proposed using some of it for the state's high-speed rail project. Steinberg said the "genesis" of the idea was a trip he took last fall to British Columbia, which instituted a carbon tax in 2008 that has a neutral effect on revenue by returning the proceeds via tax cuts. "It just struck me that the carbon tax idea and returning again the money to the people who need it the most, or at least most of the money ... had an element obviously of climate change policy, tackling income inequality, but it was also the beginning of a tax reform discussion," he said. "I'm not sure broad tax reform is going to be part of the 2014 agenda during this election year. ... In Brown's second term, it certainly should be a major issue. Maybe this proposal is the beginning." Brown signaled that he would not be amenable to raising taxes. In response to a question on the carbon tax, his press office cited his comments last month on an oil severance tax proposal. "I don't think this is the year for new taxes," he said. "I just think we ought to do everything we can to learn to live within our means before going back again and trying to get more taxes." Steinberg acknowledged detractors. "There will be critics on my left, and naysayers on my right," he said. "I think when people actually read the proposal ... they will see that it's a bold proposal that is not only consistent with A.B. 32 and strengthens it but also brings in these elements of tax reform and addressing income inequality in a way that, frankly, the current direction, current program does not." In an interview, Nichols said that cap and trade would not be likely to cause fuel price spikes. "We conduct auctions every quarter, so it's well-known what's going to happen in any given price period," she said. "I think the purpose of a tax is to get revenue that then the Legislature can spend. And if they have a two-thirds vote and they want to do that, that's their prerogative." She also pointed out that critics of cap and trade had raised concerns about price swings in the electricity industry, which has been under the cap since the market started last year. "We got a lot of advice and input about what to do to prevent sudden price spikes," she said. "We think that we're in a position to keep a careful watch and to make sure that this regulation in and of itself is not causing any new burdens on consumers, which is something we very much want to avoid." Environmental groups reacted strongly to Steinberg's proposal, saying it would upend the existing carbon-reduction programs created under A.B. 32, the 2006 law that set a target of 1990 emissions levels by 2020. By taking fuels out from under the cap-and-trade system, the sector is not guaranteed to reduce its emissions to levels needed to meet the target, they said. Steinberg's plan "is based on an artificial, sky-is-falling scenario that is used to justify dismantling a working pollution-reduction program," said Tim O'Connor, director of the Environmental Defense Fund's California climate and energy program. Oil producers were more complimentary, saying the inclusion of fuels in cap and trade poses a risk to consumers. "Sen. Steinberg deserves credit for honesty about the true cost of California's climate change policies," the Western States Petroleum Association said in a statement. "By acknowledging that the state's cap-and-trade regulations for fuels are about to have a significant impact on the cost of fuel for consumers, Sen. Steinberg has proposed a transparent carbon tax as an alternative." An environmental and public health advocate said she couldn't comment before seeing actual bill language, which has not been released yet. She pointed out that the carbon tax conversation was taking attention from a bill introduced Wednesday by Sens. Ricardo Lara (D) and Fran Pavley (D), the author of A.B. 32. That bill, S.B. 1125, would direct ARB to recommend a timetable for reductions of carbon dioxide past 2020, as well as shorter-lived climate pollutants like methane and "black carbon" particulate matter that also pose immediate air pollution hazards. "We know there's a lot of debate about this bill. Everybody's nervous about it. We're not sure what the intention is; we want to really study it carefully," said Martha Arguello, executive director of Physicians for Social Responsibility's Los Angeles chapter. "We're much more concerned with the localized impacts of air pollution and black soot and co-pollutants that warm the planet faster. We see that as a way to make our current climate laws much stronger." Economists were split on the effects of taking transportation fuels out of the cap-and-trade market. One hypothesized that it would make other sectors more vulnerable to price shocks. "My initial reaction is that while this might provide more carbon cost certainty to the fuels sector, removing fuels from the cap would be a major disruption to the cap-and-trade program and would increase the volatility of carbon costs to all the other sectors," said Jim Bushnell, an economics professor at the University of California, Davis, who has advised the state on the design of its emissions market. "If the goal is to provide more certainty about the costs of carbon, it would be better to tighten up the gap between the price floor and ceiling under the current program." Another said it wouldn't matter one way or the other. "Taking transportation fuels out of the cap-and-trade market won't have much effect on either the market or the environment," said Danny Cullenward, a research fellow at the University of California, Berkeley. He said a large amount of emissions is already going unaccounted for under the system because the rules that prevent companies from switching carbon-intensive fuels for cleaner ones from out-of-state are too lax. "The market is already running on empty, due in large part to the expectation of significant resource shuffling of emissions to other states under ARB's proposed market regulations. As a result, the cap and trade already operates like a tax, only without the transparency and predictability of a fixed price," he said.